No prior aikido experience necessary. Physically easy; no falling down. $15 per class, or DSBK membership. Class guided by Steve Self, 4th dan. Beginners, visitors and guests welcome! This class is less vigorous than aikido. We emphasize awareness, sensitivity, breathing, centering and the distinct shift from self-mind (shoga) to universal-mind (taiga) in movement. This class is about training body and mind unification — bodymind. This is a direct translation of a Japanese phrase describing a different kind of learning process. Shinshin translates as “Bodymind” - - the complete oneness of body and mind (a term we do not have in English). Toitsudo translates as “The Way of Realizing” or “The Way of Experiencing for Yourself”. Accordingly, “Realizing Bodymind” or Shinshin Toitsudo is “A Way of Learning through Bodymind”. ki-breathing meditation: Just as breathing is essential to sustaining life, it is also essential to developing our Ki and life power. 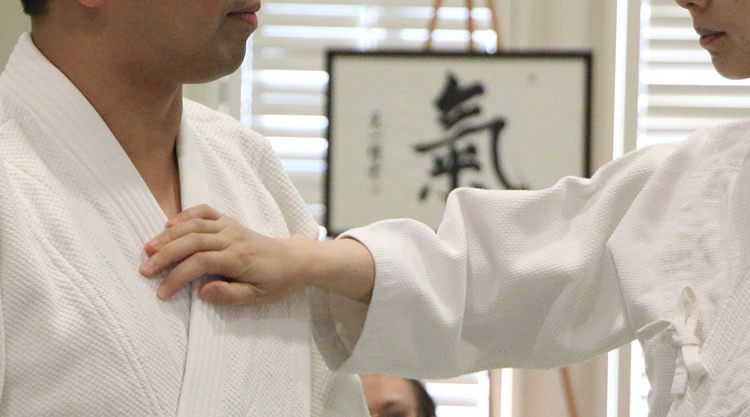 Ki breathing exercises, as designed by Koichi Tohei Sensei, are a central part of training and represents another opportunity to directly experience and realize for yourself the oneness of mind and body, as well as your original connection to the Ki of the Universe. Solo exercises for cultivating bodymind and what Tohei Sensei called One-Point, "The Universe is an infinite circle with an infinite radius. This inconceivable vastness condensed becomes the One-Point in the lower abdomen which is the center of the Universe. Let us calm our mind in this One-Point and become one with and send our Ki constantly to the Universe." Paired exercises and Ki-testing. It is easier to coordinate mind and body when we are sitting or standing still than when in motion. But true unification means to maintain the coordination of mind and body even when we are moving. The Ki Development Exercises train one to always maintain the unification of mind and body in our daily life. By applying them to our life, we can perform to the best of our ability in all circumstances. Having no color, no odor and no shape, the mind is not something that can be grasped by the senses. However, based on the principle that the mind and body are actually one, we can know the state of this ungraspable mind by testing the body, which is available to our senses. Ki tests are not founded on the idea of testing for strength or weakness. The most important factor in Ki testing is to accurately inform the person of the state of his or her mind (calm, distracted, conflicted, numb, etc...). 1. Let Mind Rest at One-Point (Principle of the mind) Seika no iten ni kokoro o shizume toitsu suru. 2. Let Body and Mind Relax Completely (Principle of the body) Zenshin no chikara o kanzen ni nuku. 3. Let Weight be Underside (Principle of the body) Karada no subete no bubun no omome o sona saikabu ni oku. 4. Let Ki Extend (Principle of the mind) Ki o dasu.